Hamas TV airs cartoon promoting the Izz Al-Din Al-Qassam Brigades, says "that thousands of young fighters are prepared to be martyred." Hamas is apparently trying to reach out to children, by airing a cartoon promoting its “military wing”, the Izz Al-Din Al-Qassam Brigades. The cartoon aired on Hamas’s Al-Aqsa TV on October 11 and was translated by the Middle East Media Research Institute. The Izz Al-Din Al-Qassam Brigades is responsible for some of the deadliest terror attacks that have killed hundreds of Israelis. “As I have told you, there were times when the Al-Qassam Brigades had to work hard to obtain the means to oppose the occupation and inflict heavy losses upon it. There were only a few Al-Qassam cells, and their weapons were primitive and sparse. They even had to move some weapons between areas because there were so few,” says the narrator in the cartoon. “Today, things have changed – the Hamas of yesterday is not the Hamas of today, and the Hamas of tomorrow will be even stronger militarily,” he continues. 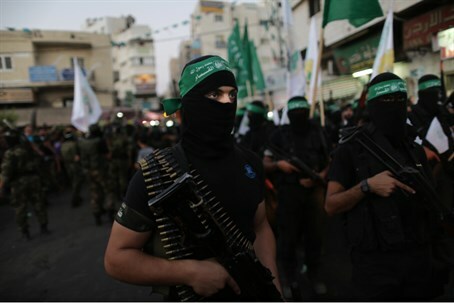 “The well-organized Al-Qassam army is mightier and more effective. [Hamas used to have] stones, slingshots, knives, and very few pistols, but today, the Al-Qassam Brigades possess missiles, which undermine the Zionist security theory. Their capabilities transcend geographical borders. “Today, the Zionist occupation knows who the Izz Al-Din Al-Qaam Brigades are, and it knows that thousands of young fighters are prepared to be martyred for the sake of Allah, until this land is liberated,” says the narrator. Incitement against Israel in Palestinian Authority-based is nothing new and, while it is widely expected coming from Hamas, it is also found in media that is controlled by PA Chairman Mahmoud Abbas, who is touted as Israel’s “peace partner”. One such incident was when PA TV broadcast a crudely anti-Semitic program legitimizing violence against Jews in Judea and Samaria - who were stereotyped as violent thieves. The end of the program glorified the humiliation of a religious Jew by cutting off his peyote side-curls, in a scene chillingly reminiscent of Nazi anti-Jewish propaganda. Other broadcasts included airing a music video encouraging violence against Israelis, and the glorification of the murderer of 61 Israeli civilians on the official Facebook page of Abbas' Fatah party. Abbas himself recently said that there would not be a single Israeli (i.e., Jew) living within a future PA state. Israeli officials, including Prime Minister Binyamin Netanyahu, have said that ending the incitement against Israel is a key factor in achieving peace.